This holiday season may have a dearth of options, and the current economic disaster is not be the only thing to blame. Right after an analyst decreed Apple's iPod to be in short supply this season, Amazon's Kindle eBook reader disappeared from shelves and will not be available until February of next year. The Kindle has been out for a year, and has been enormously popular, so its vanishing makes a degree of sense. But one would figure Amazon understood the demand for its product and would stockpile appropriately. Another theory is that Amazon might be making room for the updated Kindle 2.0, which was revealed in snippets earlier this year. 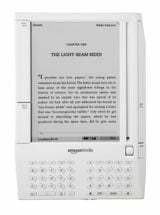 Even though Amazon stated the Kindle 2.0 would not be released in 2008, the early photos and detailed specs made it clear that the company would have to vanquish its Kindle 1.0 stock to make room. Meanwhile, shoppers for the eBook reader are out of luck. Unless, of course, you're willing to brave eBay's price gouging.